A weak doesn’t seem like a long time to explore all of Egypt but with “Trips In Egypt” it’s all the time you need to witness some of the most breathtakingly beautiful destinations in Egypt as your 7 Days Egypt Itinerary Cairo, Luxor, and Aswan will be filled with a sense of excitement enjoy a tour to all amazing monuments like Edfu & Kom Ombo and the magical Valley of the Kings. Upon arriving at Cairo airport, our employee will be expecting you at the entrance gate and transfer your to check-in at 5* hotel in Cairo, start your 7 Days Egypt Itinerary with a dinner cruise and a colorful belly dancing show with a folklore band and a stunning "Tanoura Spin", then back to your hotel. 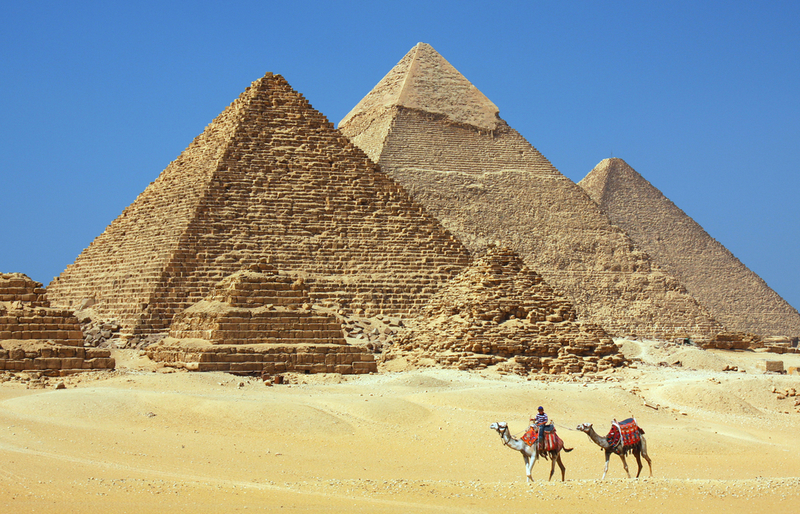 Second Day: Tour to The Pyramids - Fly To Luxor. Enjoy your breakfast in the early morning, then live the adventure you deserve by cast your eyes on "Pyramids Complex" which holds the world’s largest pyramid and one the Seven Wonders of the World "Great Pyramid" of (King Khufu) which is 147 m high and took about 2,300,000 pieces of building block to construct, and The great Sphinx the guardian of Egypt and the world’s oldest sculpture. Continue your tour to The Valley temple where the mummification process took place, then move to have your lunch and enjoy a tour enter the magical "Egyptian Museum" which contain some of the rarest artifacts dating back to 3,500 years. At the end of your Cairo tour, you will be driven to Cairo airport to catch your flight to Luxor and check-in at 5* hotel in Luxor. Have your breakfast, then join your own tour guide through a tour to mesmerizing Luxor where you can find some hypnotically beautiful monuments like "the Valley of the Kings" the home to the well-preserved tombs to many great kings and queens from the 18th to 20th dynasties such as 'Ramses II' and (Tutankhamen). 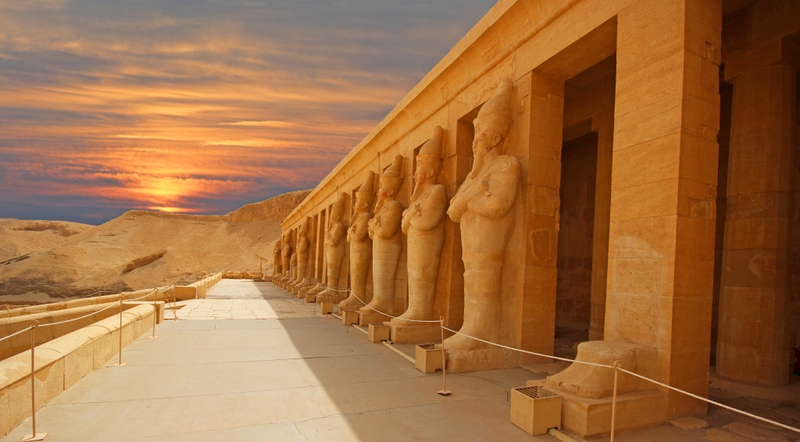 Keep moving on until you reach the gorgeous "Queen Hatshepsut temple" which is a true symbol of the brilliant classical architecture of the ancient Egyptian. Continue your tour with the amazing sight of the Colossi of Memnon which is two massive statues in the shape of (king Amenhotep III). Have your lunch on an island, and board a boat so you can cross to the other side of the Nile to the holy "Karnak Temple" which is the biggest temple complex ever built by man in history to become a house of worship. Finally get back to your hotel in Luxor for the overnight. Have your breakfast in the early morning, and accompany your tour guide to "Kom-Ombo Temple", the house of the crocodile god Sobek with Hathor and Khonsu and "the falcon god Horus" that was built in Ptolemaic dynasty, then turn your eyes to "Edfu Temple" which is the house of the god Horus and the most preserved "Graeco-Roman" temple in Egypt. Then ride your private A.C car to your 5*hotel in Aswan for the overnight. Fifth Day : Visiting Aswan Landmarks. Begin your tour in Aswan by having your breakfast and joining your tour guide to visit the High Dam that had a significant positive effect on the economy and culture of Egypt. Turn your eyes to "Unfinished Obelisk" of Hatshepsut which is undoubtedly the largest obelisk in Egypt, then you will have your lunch before moving to the temple of Isis "Philae Temple" which is located on starting from 1970 when the UNESCO relocated it from its original location to a new one in order to save it from the dangers of the Nile floods. Spend your overnight at a 5* hotel in Aswan. Sixth Day: Visit Abu Simbel Temples - Fly Back to Cairo. In the early morning, join your own tour guide to visit "Abu Simbel Temple" by an A.C car with your breakfast boxes. The temple is known to be a true work of art, the temples were carved out of the mountainside in 13th century BC during the reign of 'Pharaoh Ramesses II', all the carvings, artwork, wall paintings, statues are extremely beautiful and tell incredible stories about 'Ramesses' victories at "The battle of Kadesh". Finally, return back to Aswan and catch your flight back to Cairo and overnight at 5* hotel. Enjoy your breakfast at the hotel, then our employee, will drive you to the airport and assist you with finalizing all of your departure formalities and this will be the end of your 7 days Egypt tour Cairo and Upper Egypt. Accommodation at 5*hotel for 2 nights in Luxor. Accommodation at 5*hotel for 2 nights in Aswan. You will be accompanied by a private tour guide during your tours. All the transportation's across your destinations will be by a private A.C car. Domestic flights all across Cairo, Luxor, and Aswan. All of your entrance fees to the sites, taxes or services are included in your itinerary. Drinks are all part of your personal expenses.